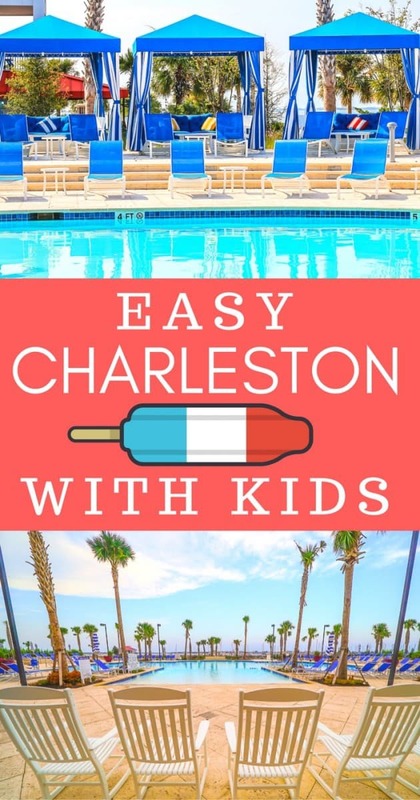 For families wanting to explore Charleston with ease, it provides a unique hybrid vacation formula of resort fun by day, Charleston sightseeing at night. The new Beach Club is beautifully designed. Imagine you owned a favorite Gretchen Scott jersey tunic that you loved so much, you wished you could sleep in it. Well, you sort of could. 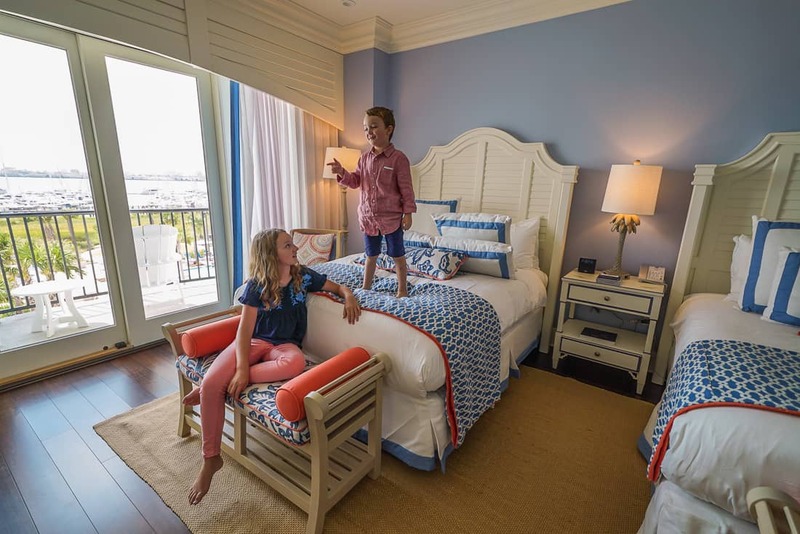 If those colorful vacation frocks found along all of the most stylish East Coast resorts had inspired the design of a hotel, it would easily be the new Beach Club at Charleston Harbor Resort and Marina. It’s elegant, incredibly comfortable, and as colorful as it is preppy. You could dress it up or down based on a critical choice: heels or flip flops. 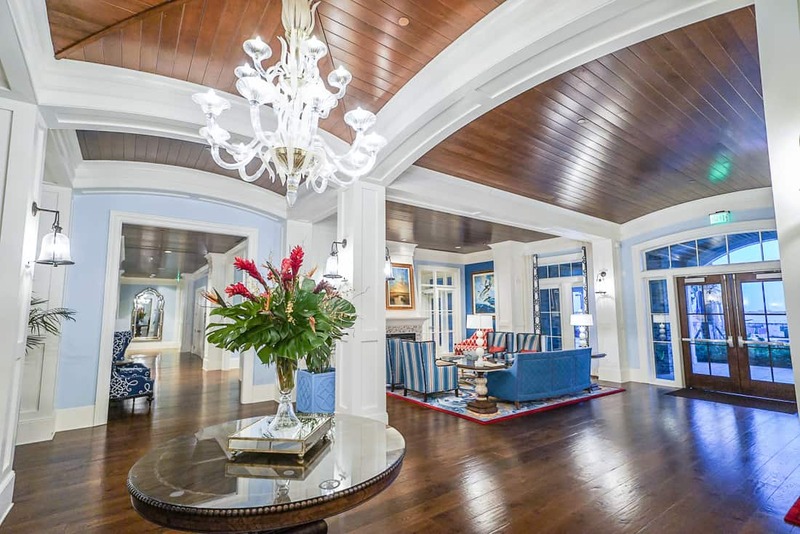 The design of the Beach Club is vibrant with every shade of blue from sky to navy used alongside conch shell corals. Get ready for lots of blues in all of the public spaces and rooms. 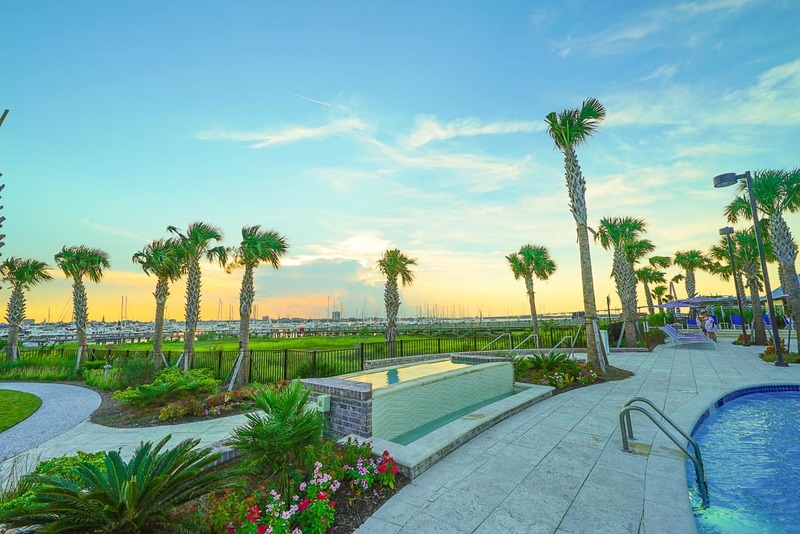 The Charleston Harbor Resort and Marina debuted a new, luxury building to their waterfront resort in Mount Pleasant that overlooks Charleston from across the harbor. Called The Beach Club, it’s a member of the Leading Hotels of the World. 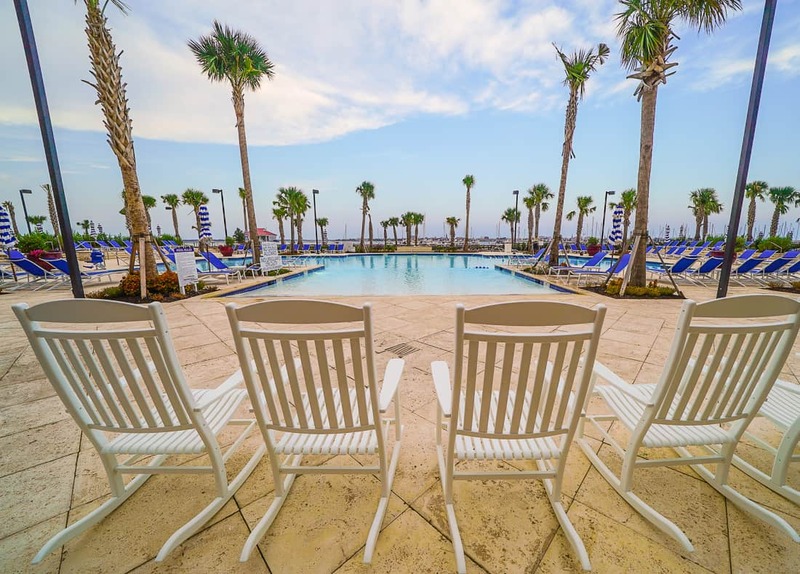 The resort pool is its key feature for a hotel so close to downtown Charleston. 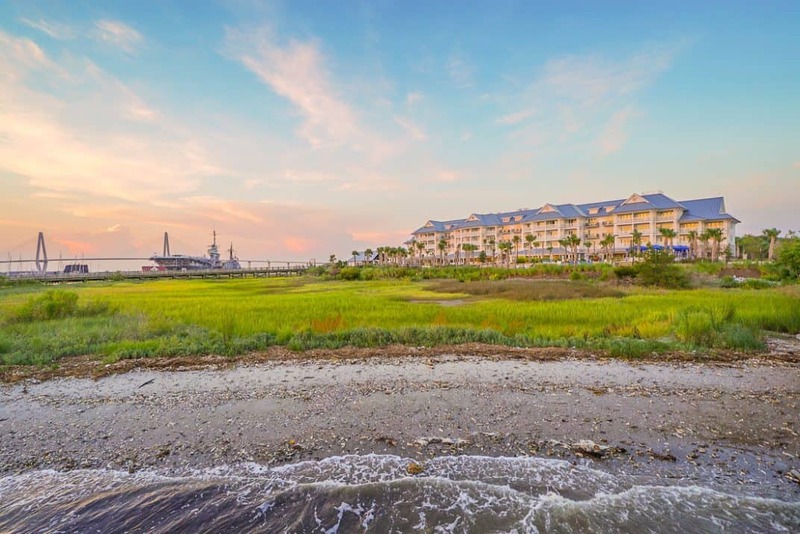 The Beach Club and Charleston Harbor Resort location and weather. 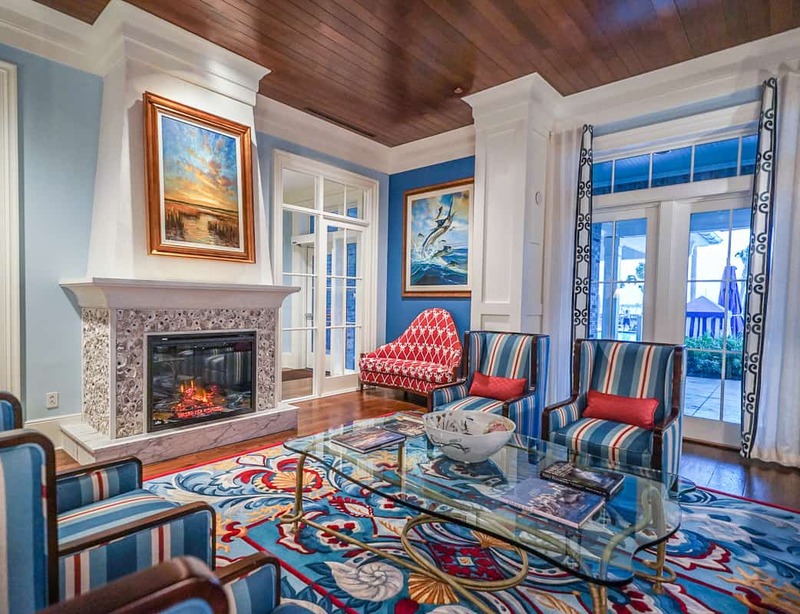 The Beach Club at the Charleston Harbor Resort and Marina is a unique property in the Charleston area because it’s mere minutes from downtown, while feeling like a full resort. It’s west-facing location means that the sun sets with a symphony of colors every night from your balcony or the resort pool. Enjoy nightly sunsets with water views. 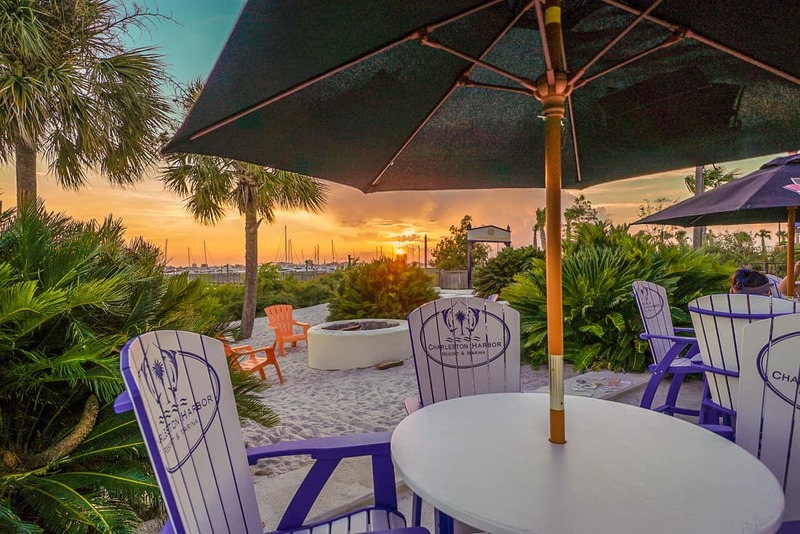 Compared to staying at a downtown Charleston hotel with a parking garage with fees, The Beach Club is an ideal hotel choice for those who will have a car to explore the area. Downtown can be accessed by water taxi or by a trolley shuttle from the resort for those who fly in and choose not to rent a car. Average temperatures run warm enough for the swimming pool from April through October in Charleston. We stepped into our room, and my children gasped in delight from its charm. When you accidentally match a hotel room to a T.
As New Englanders, we are used to this bright palette to signify beach vacations because we hail from the world of Kelly green whales imprinted on grown men’s navy slacks. But I loved how The Beach Club insured that you knew you were unequivocally at a South Carolina resort with local touches throughout the room. Key lime cookies and Benne wafers greet guests. One of the oldest bakeries in the area, Olde Colony Bakery, makes many local treats that are available as gifts for guests. 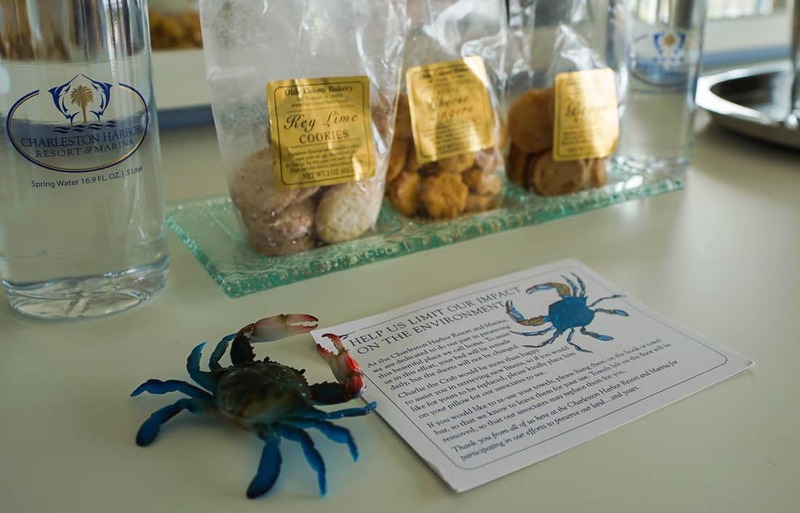 Sample bags of the famous Benne wafers, key lime cookies, and cheese zingers greet guests for a sweet taste of Lowcountry. Charlie is a glass figurine of the local crab caught right from the traps of the Charleston Harbor Resort. Guests put Charlie on their sheets to communicate to housekeeping to change the sheets. 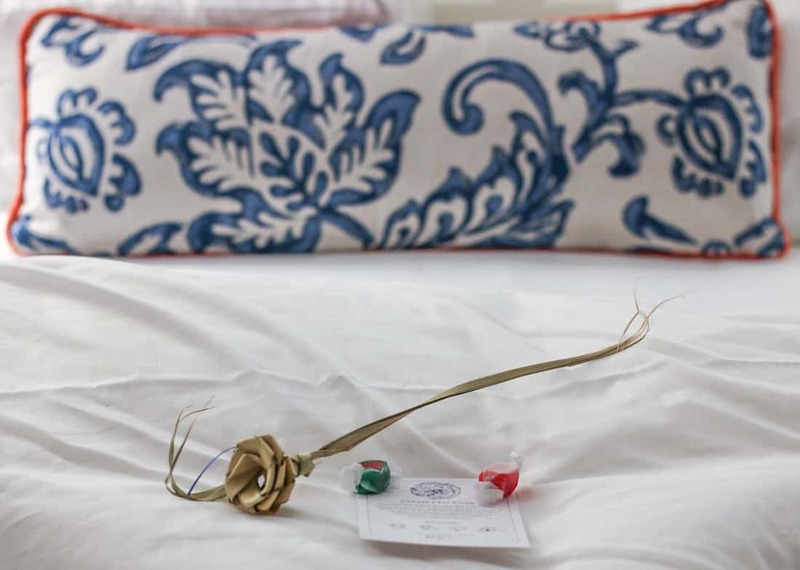 And at turndown service guests receive a straw palmetto rose on their pillow along with locally made salt water taffy. Palmetto Roses to tuck you in. That hotel’s hallways run along the exterior wall overlooking the parking lot so every room has a beautiful water view. Our family had a room with two queen beds and bright white and blue bathroom. 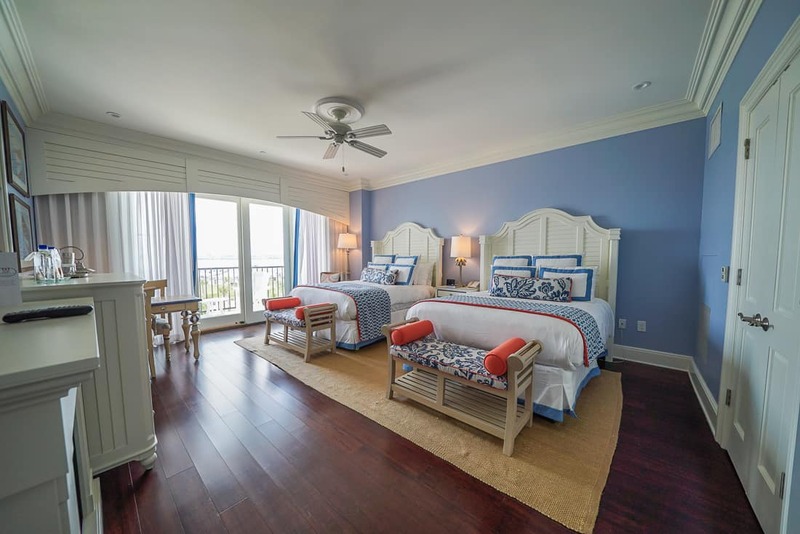 There’s also a family parlor layout available with a king bed in the main room and a sleeping room with two twin beds. 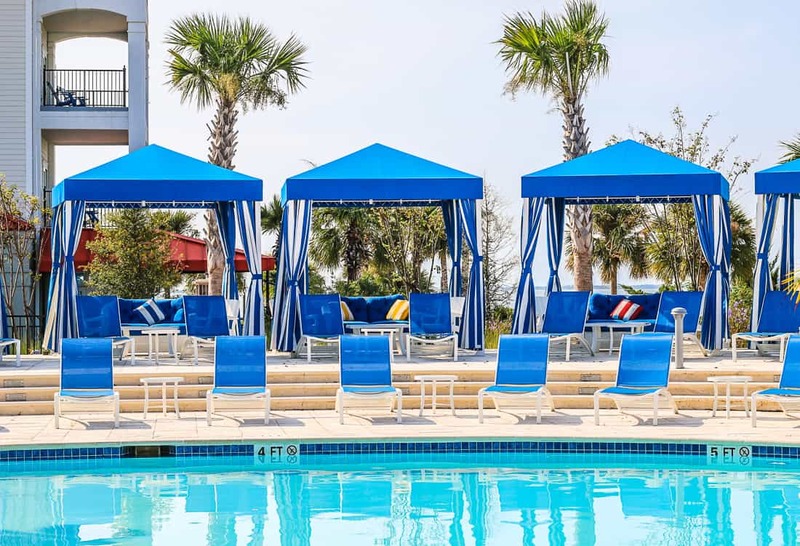 The Beach Club’s showcase feature is, of course, its expansive resort pool overlooking the Charleston Harbor Marina. There are no waterslides or pool features specifically for kids, but there is a zero-entry area perfect for younger children. The staff provide a daily ice cream treat in the afternoons. Cabanas at the adult pool at the Charleston Beach Club. There’s a smaller pool adjacent to the main pool with cabanas attached designated as an adult pool. The main pool never got rowdy enough for the adults to seek refuge from splashes or noise. The spectacular setting and scale of the pool provided a tranquil and serene day of swimming and sunning for all ages, while I noticed adults embracing a frozen rosé slushee called Frosé. There is a recreation director, Amy, who runs a kids’ program called Mini Mariners Camp based at the original property next door that also houses the fitness center. Amy has bounds of energy and set up a full morning of activities in a shaded patio area. The Mini Mariners Kids Camp was a hit with my kids who enjoyed so many different types of activities. Crafts, games, treasure hunts were waiting for my kids. 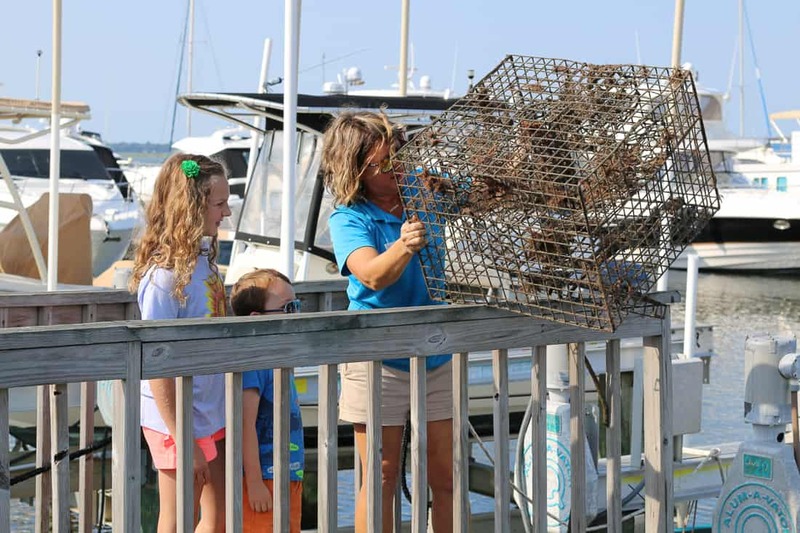 But before the hot summer sun got too warm and bright, Amy grabbed a net and took my children off to the marina to learn about crab traps. My children learned about crab traps from Amy, the recreation director. Amy was so adept at engaging children of different ages since my children are five years apart. There was a wonderful pirate treasure hunt scheduled on the sandy beach that evening that my children were eager for, but the thunder clouds rolled in and plans had to change. My children loved watching the slow moving barges and a a summer storm roll in from our balcony while playing with their homemade putty they made with Amy. Because an evening family event was cancelled due to rain, Amy arranged for a movie in the Beach Club’s theater, complete with popcorn. 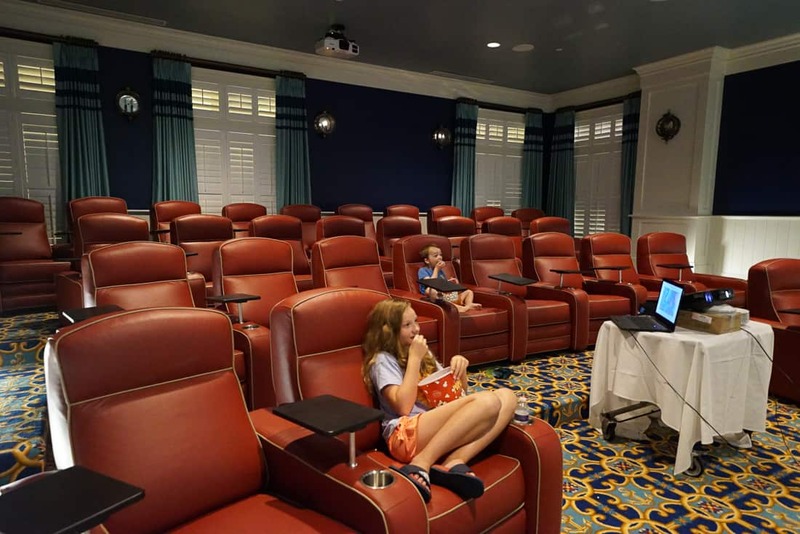 A little popcorn and movie in the Beach Club theater when the rain cancelled a pirate treasure hunt on the beach. 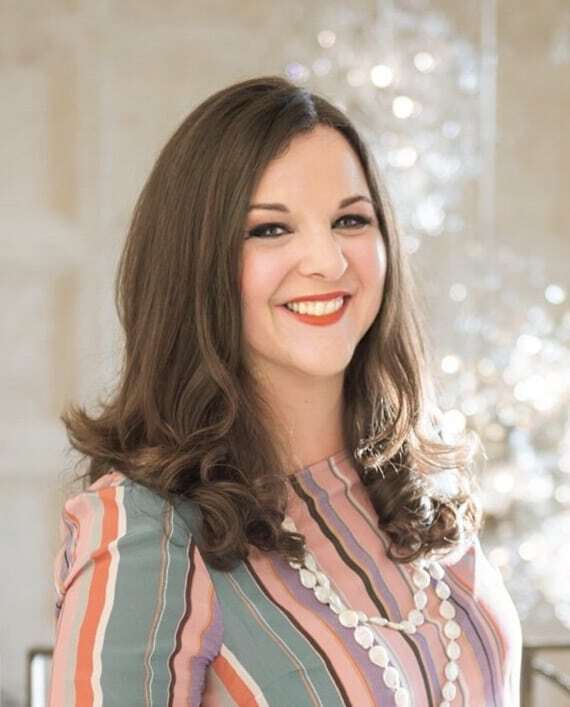 It is a sad stay for me when I don’t even get to see a hotel spa, much less get a treatment, but my kids and I were simply too busy having fun for me to break away for a treatments. The Estuary Spa uses Naturopathica, the holistic and herbalist inspired line that uses natural ingredients. Guests can get massages, facials, body treatments, and waxing, but no salon or nail treatments. I hope to try it on our next visit and will post updates. The resort offers room service through an onscreen menu through the television. Room service delivery times were a little slow, so we preferred our meals at the onsite restaurant, the Charleston Harbor Fish House. 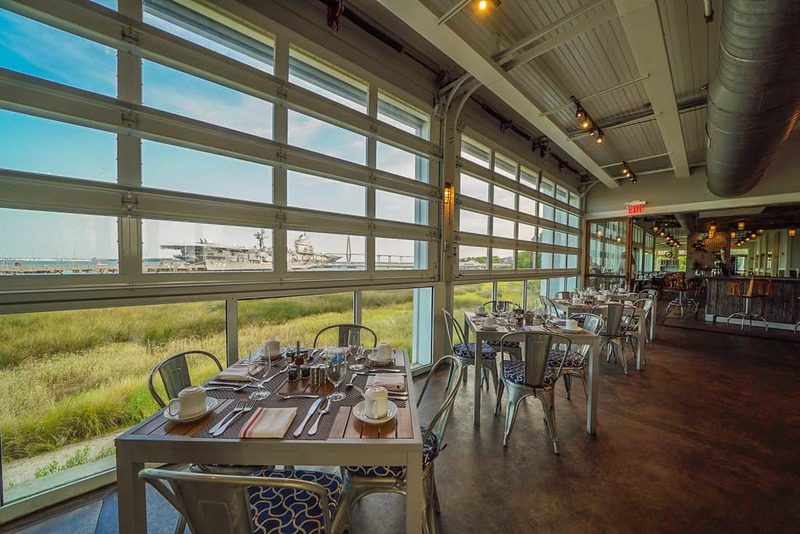 The Charleston Harbor Fish House has beautiful salt marsh views of the USS Yorktown. Located in the marina building with the Marina ship, the restaurant serves three meals a day facing the USS Yorktown at Patriots Point next door. Our breakfasts were made to order and hearty, and the children’s menus worked well at dinner. My most memorable dishes were fried green tomatoes and a local, sustainable fish called wreck fish. It isn’t super popular because it is challenging to prepare, but mine was delicious, reminding me of all that I love about halibut and grouper. 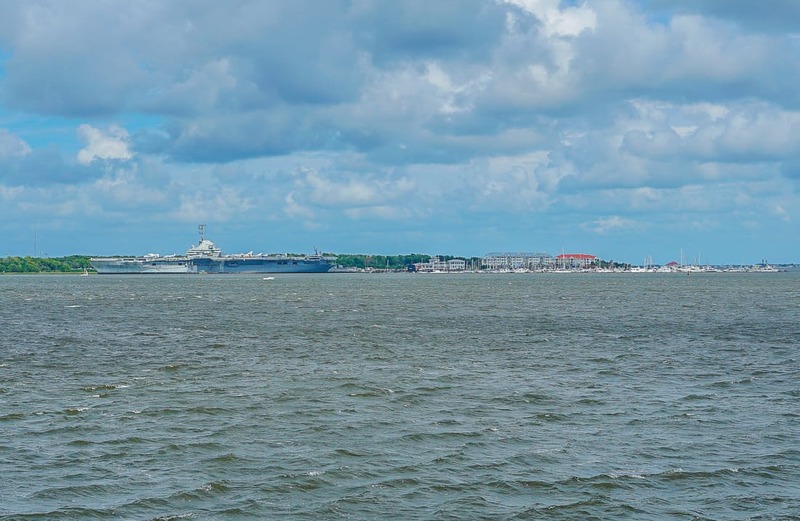 Patriots Point houses the USS Yorktown, a naval ship built in the second World War and used until the Vietnam War. Because there is no climate control on the ship, I have been told to visit it early in the morning in the summer before afternoon temperatures peak inside the ship. The water taxi that embarks from the hotel goes to two stops downtown. The South Carolina Aquarium is one block from the Aquarium Wharf stop. My kids loved the touch tanks, interactive exhibits, hurricane simulator, and the sweeping views. Have your children find your hotel from the Aquariums beautiful harbor-facing location. 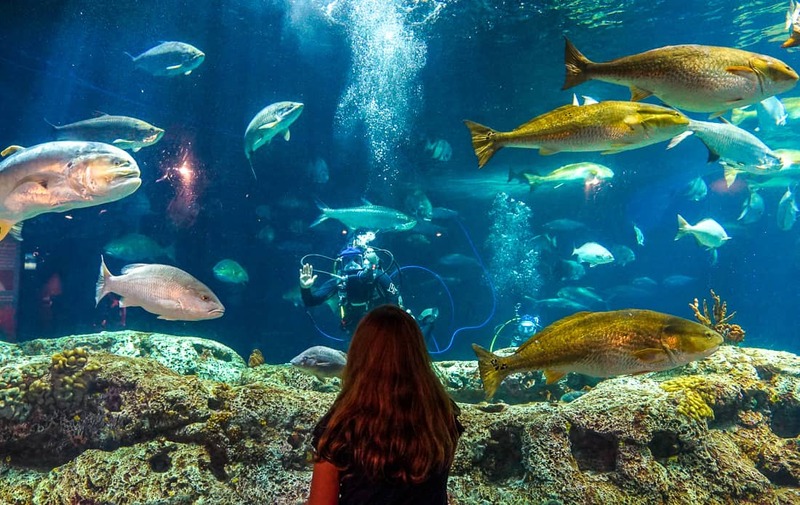 The South Carolina Aquarium takes between two and four hours to enjoy. There are many exhibits and activities. The second stop downtown at Waterfront Park is closer to the restaurants and stores of the French Quarter in the historic district. 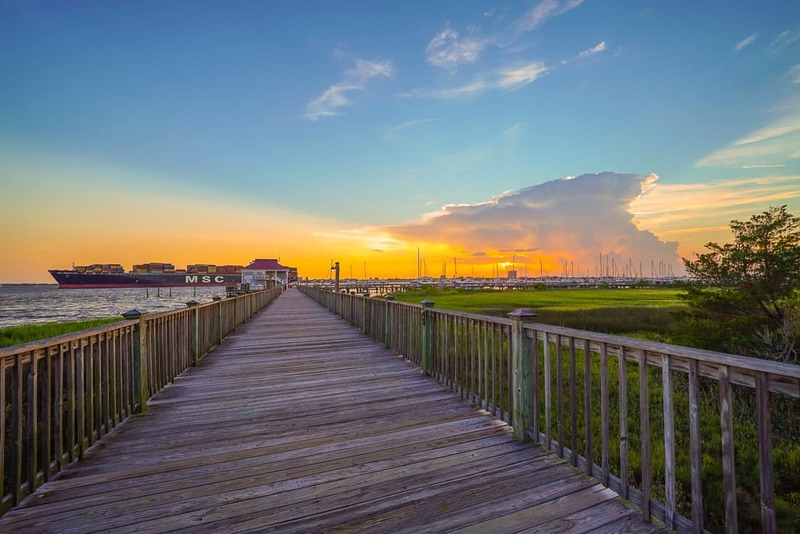 Fleet Landing is a popular waterfront seafood restaurant that is a quick walk away for an easy dinner off site. Mount Pleasant is on the way to many beach islands and Charleston beach resorts. The nearby Isle of Palms offers public beach access not far from the hotel. 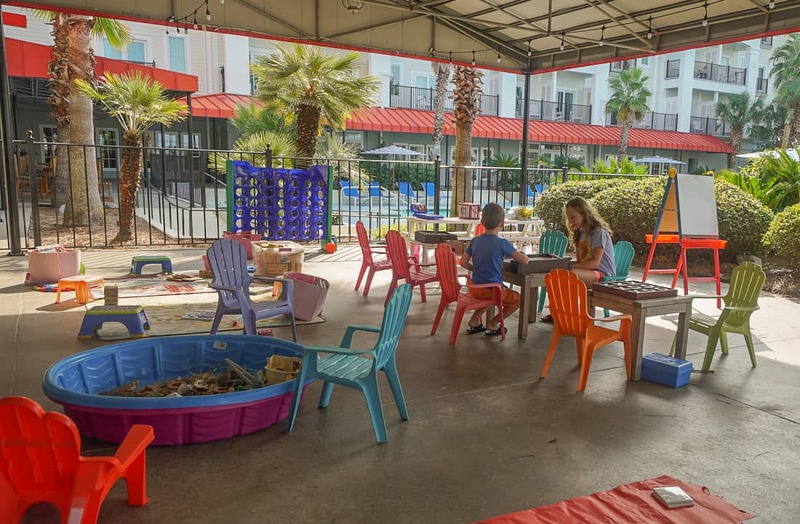 The Beach Club at Charleston Harbor Resort offers such a family friendly way to explore Charleston, a city that belongs on everyone’s bucket list. Pack your white jeans, some metallic kitten heel sandals, and your favorite beach tunic and see what all of fuss is about. Every day ends beautifully with such spectacular views at the Beach Club. Although we were guests of the Beach Club at the Charleston Harbor Resort and Marina, these opinions are entirely my own. Check your dates for rates at the Beach Club. 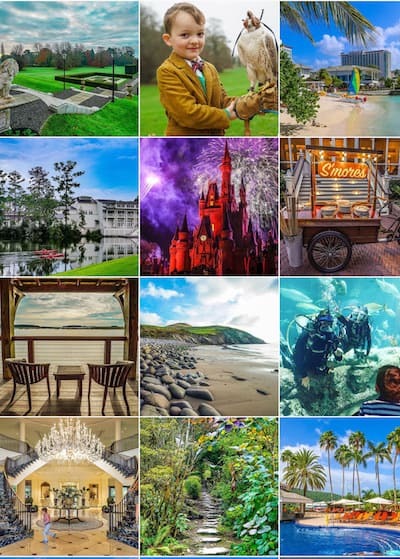 Check out our other South Carolina hotels and resorts we love.